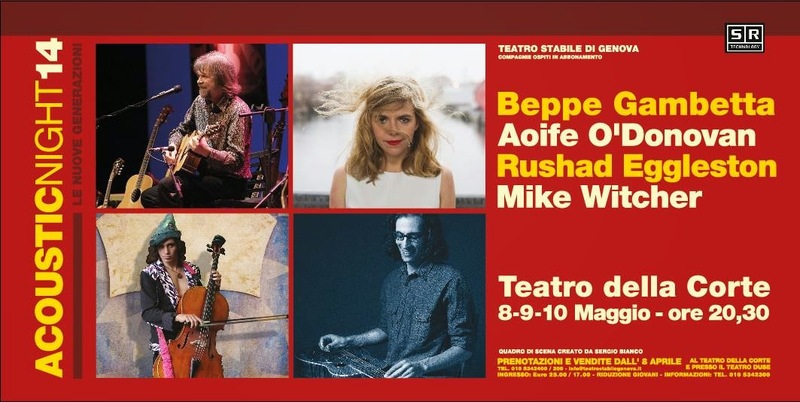 On May 8th, 9th and 10th the 14th Acoustic Night event was held at the Teatro Della Corte in Genova, Italy organized and produced by Beppe Gambetta and his wife Federica Calvino Prina. This year was dedicated to the talents of the New Generation. On stage with Beppe was the songwriter Aoife O'Donovan, resonator guitarist Mike Witcher and cellist Rushad Eggleston. The Acoustic Night event was attended by 3,000 people with people coming from the USA, Germany, Austria, Switzerland and the UK. Three intense and unforgettable evenings brought the audience a program focused on new musical tendencies and virtuosity that also included traditional material. Such is the success of the event, Acoustic Night 15 is adding a fourth night and is already scheduled for May 6, 7, 8 and 9, 2015. To give you a 'taste' of what took place during the 2014 event, and what you might expect in 2015, here are some videos of the Acoustic Evening. Firstly, Beppe and Rushad performing (with Beppe in one of Rushad's hats). ..and finally, Rushad performing an introduction like only Rushad can..